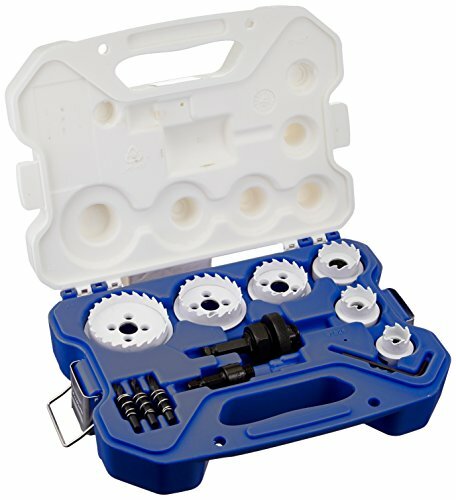 The Lenox Tools 30878500CHC Electrician's Carbide Hole Cutter Kit - 15 Piece is designed specifically for sheet metal applications for an electrician. The precision ground carbide teeth provide fast cutting of clean round holes. The over drill stopper on the back of the cutter ensures that you will not drill beyond the hole, reducing the risk of damaging the work. This cutters feature a split point pilot drill that starts on contact to ensure accuracy with faster penetration and less walking. The cutters also feature a spring in the center to eject the plug once the hole has been cut. The Electrician's Set comes with 6 hole cutters with 7/8-Inch, 1-1/8-Inch,1-3/8-Inch, 1-3/4-Inch, 2-Inch and 2-1/2-Inch Diameters, as well as 2 Arbors, 1/4-Inch Pilot bit, replacement ejection springs and a 1/8-Inch Hex wrench. The Carbide Teeth last longer than a traditional Bi-Metal hole saw. View More In Hole Saws & Accessories. Zenith Industries ZN103128 Carbide Tooth Hole Saw Set (6 Piece), 5/8" - 2"